MAE SAI, Thailand -- Thai authorities say a former Navy SEAL working to rescue boys trapped in cave has died from lack of oxygen. According to BBC News, Saman Kunan, 38, lost consciousness on his way out of the Tham Luang cave complex after delivering supplies to the missing group, officials said. "A former SEAL who volunteered to help died last night around 2 a.m.," Chiang Rai Deputy Governor Passakorn Boonyaluck told reporters at the rescue site, BBC News reports. "His job was to deliver oxygen. He did not have enough on his way back." He could not be revived by his colleagues, according to BBC News. 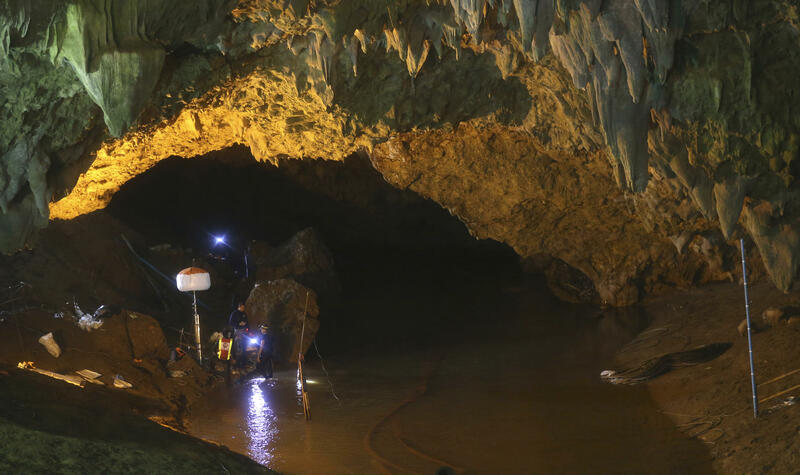 Thai authorities are racing to pump out water from a flooded cave where 12 boys and their soccer coach have been trapped since June 23. Crews are drilling through rocks to make room for more hoses in an effort to quickly drain water from the cave before up to five inches of rain descends on the area, CBS News foreign correspondent Ben Tracy reports. They have already pumped out more than 34 million gallons of water, but so far it's not enough to safely remove the boys, who have been trapped inside for nearly two weeks. Even with medical treatment, some of the boys are said to be showing signs of weakness and malnutrition, prompting rescue crews to pump oxygen into the chamber where they are trapped.